Hasselblad has announced its 50-Mp X1D mirrorless medium format camera weighing less than half what a conventional medium format camera weighs. The handmade body features a CMOS sensor which complements a new line of dedicated autofous lenses. H system lenses can also be used with an adapter. Hasselblad CEO Perry Oosting said, "The X1D marks a pivotal point in Hasselblad's rich 75-year history. This camera makes medium format photography available to a new generation of Hasselblad users, while pushing the existing limits of photography to new heights." Phocus 3.1 for simple and quick Raw image processing. Adobe Photoshop and Lightroom compatible. The $8,995 X1D, $2,295 45mm lens and $2,695 90mm lens will be available for from Hasselblad dealers. Adorama is accepting pre-orders for the X1D, 45mm lens and 90mm lens. B&H is also accepting pre-orders for the 45mm lens and 90mm lens. A demo can also be arranged. GOTHENBURG, Sweden -- Hasselblad is proud to introduce the groundbreaking X1D. Weighing less than half that of a conventional digital medium format camera, the mirrorless 50-Mp camera is a game changer in the world of photography. Inspired by the brand's iconic design heritage, the camera is ergonomic and compact, offering a handling experience unlike any other. Handmade in Sweden, the X1D combines Scandinavian sensibility with beautiful performance. Like the V System, the X1D seamlessly combines portability with excellent optical quality for which the brand is renowned. Hasselblad has ingeniously introduced mirrorless technology to digital medium format for the first time ever, creating a precision performance camera that can sit in the palm of your hand. The 50-Mp CMOS sensor captures the finest details with true natural colors. 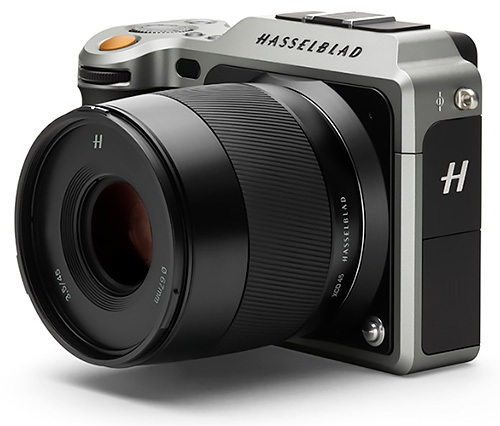 Commenting on the announcement Perry Oosting, Hasselblad CEO noted: "The X1D marks a pivotal point in Hasselblad's rich 75-year history. This camera makes medium format photography available to a new generation of Hasselblad users, while pushing the existing limits of photography to new heights." Weighing just 725g and including HD video, WiFi and built-in GPS, the X1D is a trusted partner and ideal travel companion. The robust exterior is dust and weather proof, providing durability to take with you wherever you go.